What is Erythroblastosis Fetalis ? Erythroblastosis fetalis is a medical condition that needs immediate medical attention. It is also known as haemolytic anemia. It is a result of blood type incompatibility of the mother and the baby inside her womb, specifically the fetal blood group e Rh0 (D) antigens. The Rh factor is a type of inherited protein situated on the surface of the red blood cells (RBCs). If you this type of protein, it is an indicator that you are Rh positive. Those who don’t have are Rh negative. What are the causes of Erythroblastosis fetalis? Rh incompatibility – This problem occurs if the mother is Rh negative and gets pregnant by Rh positive father. It results to Rh disease wherein the baby becomes Rh positive. ABO incompatibility – This occurs if the mother and the baby’s blood types are incompatible. When is Rh incompatibility becomes a problem? The danger with Rh incompatibility is when the mother’s blood mixes with the fetus’ blood during pregnancy. It does not matter whether the blood that mixes is small or big. Once the bloods mixed, it could lead to complications to the offspring. Invasive prenatal procedures such as chorionic villus sampling and amniocentesis (amniotic fluid test). The problem with Rh incompatibility is the possibility of experiencing Rh sensitization (an immune response). The immune system of the mother will recognize that there is a foreign thing inside the body and as a defense mechanisms, the immune system will attack them. Antibodies will be produced to prevent exposure to Rh factor, to the point that it will use the blood supply of the fetus. This is where the real danger takes place. Using the blood of the fetus could destroy the fetus’ red blood cells, which leads to the condition called erythroblastosis fetalis. 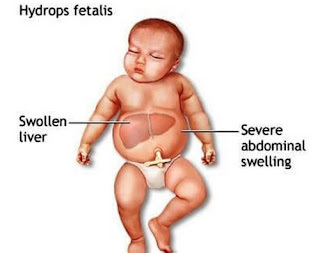 Such disease condition in the newborn is called hymolytic disease. The newborn’s body does not have the ability to excrete and break down RBCs. The newborn’s bilirubin level is high. The bilirubin is a by-product of RBCs breakdown. Figure 1 : A newborn with erythroblastosis fetalis. 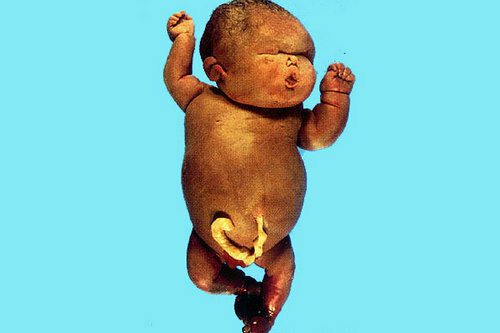 The amniotic fluid appears yellow, which indicates a high bilirubin. This can be assessed during amniocentesis. An ultrasound during pregnancy will reveal the presence of fluid in the lungs, scalp, and abdomen. The newborn’s skin is pale. The newborn looks yellow, particularly the eyes and umbilical cord. The yellowish discoloration is obvious at birth or a few hours after delivery. Fetus complications – The bilirubin level of the fetus is high. There is a mild to severe anemia, along with yellowish discoloration of the skin. It could also lead to hydrops fetalis (an accumulation of fluid in the fetal tissues and organs leading to heart failure). Such condition could lead to stillborn (a baby born without signs of life). How to diagnose Erythroblastosis fetalis? It is important to establish that there is indeed an Rh incompatibility, especially during pregnancy. A Rhesus factor testing for parents should be done to assess the potential risk. It is done on the first trimester of pregnancy and needs to be repeated if you are in your 28 weeks gestation. Other testing and diagnosis include amniocentesis, ultrasound, fetal umbilical cord blood testing, and fetal middle cerebral artery blood flow measurement. Paternal Rh factor should be checked too. A fetal blood transfusion should be given during pregnancy. The fetus should be delivered between 32 to 37 weeks gestation. For the newborn, there will be a variety of treatments needed such as intravenous fluid, blood transfusion, intravenous immunoglobulin, and management of respiratory problems. Intravenous immunoglobulin antibody therapy helps reduce the breakdown of red blood cells and manage the level of bilirubin in the blood. In some cases, an exchange transfusion is necessary. In this treatment approach, a small amount of the newborn’s blood is removed and will be replaced by fresh blood. By doing so, the number of red blood cells will be significantly increased and the bilirubin level will be lowered. What you can do to prevent Erythroblastosis fetalis? Give the woman Rh immunoglobulin (RhIg). It prevents the mother from producing antibodies. However, it should be given before Rh sensitization. If you are at risk for Rh sensitization, you should receive RhIg during pregnancy (28 weeks gestation) and after giving birth (within 72 hours). RhIg is also known as RhoGAM. Do not be confused with these two terms as they are actually the same. It should also be given to women within 72 hours after abortion, ectopic pregnancy, or miscarriage. If you are in your 40 weeks gestation, an added dose of RhoGAM is needed. The dose is calculated based on anti-Rh titer in the patient’s serum. In the United States, erythroblastosis fetalis is rare and it is primarily linked with early detection, treatment, and preventive measures.